CAMRI sells and supports two types of product: Printers/Copiers and Duplicators. These products use different technologies, and are thus appropriate for different applications. Riso printers such as the HC and ComColor series are ink-jet printers. These machines use a piezo-electric ceramic printhead developed by Xaar in Cambridge. In the print head an electrical signal causes the ceramic to squeeze out a tiny pico-litre drop of ink. Actually, the ink is squeezed from ceramic channels that are less than the width of your hair, at up to 120,000 times a second. This technology is highly reliable: Xaar tried electrically squeezing its ceramic print heads over 10 trillion times and the print heads didn’t wear out or break. It’s also ‘green’, as very little power is needed to electrically squeeze the ceramic printhead. This technology is commonly used for high-speed printing of graphics, labels, packaging, ceramic tile decoration, and outer case coding. It is not available in many printers designed for organisations to print their own medium to high-volume printing at low-cost. Riso combines it’s expertise in low-cost ink, high-speed paper flow with Xaar’s printheads to deliver the fastest colour printers with the lowest cost per copy. Like the duplicators, the printers use Riso’s inks, and not expensive dry-toner common in photocopiers. Riso Printers have scanning options for copying, as well as stapling, collating and folding options. Admittedly a new Riso is a little more expensive than a standard copier or printer, but if you are printing more than 8000 sheets a month, you will soon start saving money. A duplicator first scans the original sheet on a flat-bed scanner. The duplicator then burns an image of the original onto a blank master, by creating tiny holes in the master. The master looks a bit like tissue-paper. The duplicator then automatically wraps the burnt master around a cylindrical drum. To print, the cylindrical drum rotates, whilst the paper passes underneath. At the same time, the duplicator forces ink through the holes in the master, creating a copy of the original. When the print run finishes, the duplicator automatically disposes of the burnt master. When printing more than about 15 copies, duplicators are far cheaper than a photocopier. Photocopiers use dry-toner, whilst Riso duplicators use wet ink. Modern duplicators use a vegetable based ink, which gives superb results. 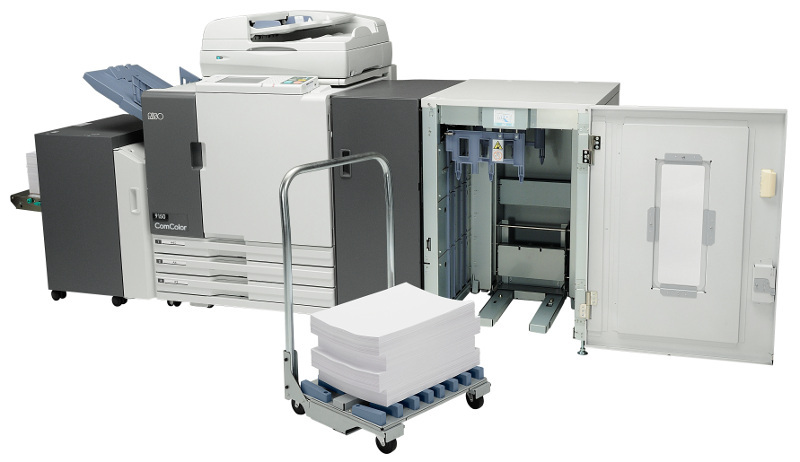 Riso duplicators usually print in a single colour at up to 180 sheets per minute, even in A3 format. However, one model can print in two colour in a single pass. 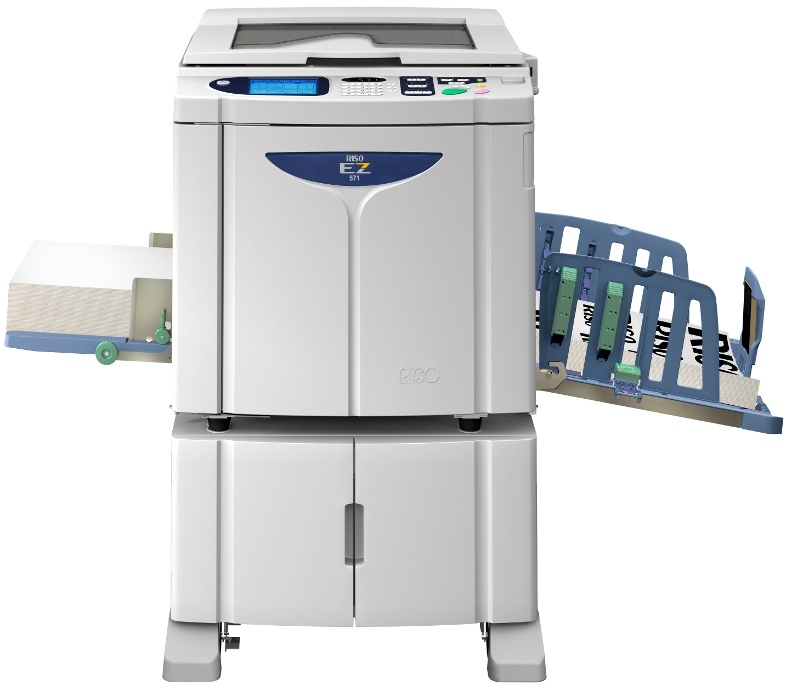 These days, Riso duplicators are networked, so that users can directly print from their PC. Fast-drying inks: print ready for next step, boosting productivity. Lower power consumption than 9050.